FIDE Master and former National Under 11 Champion Rakesh Kumar Jena scored the first upset defeatingGrandmaster Axel Rombaldoni of Italy in the first round of the 7th Chennai International Open Grandmaster Chess Tournament at Nehru Stadium, Chennai here today. 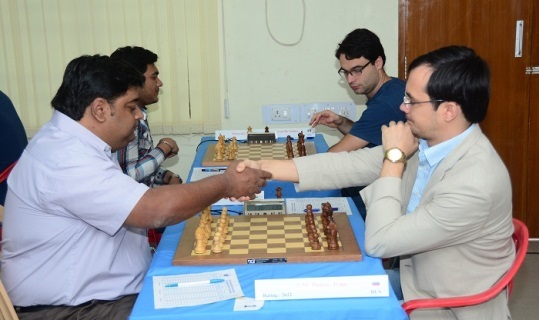 Top seed Grandmaster Ivan Popov of Russia comfortably scored over Vivek Nambiar in the top board. The advanced French game saw the Orissa junior Rakesh Kumar Jena starting off in a confident manner against Italian Grandmaster Axel Rombaldoni. In an ensuing middle game tactic, Rakesh got his pawn on an advanced “c6? square by 13th move. Axel found himself in further trouble, as Rakesh fluently converted his initiative into a winning position, with clinical precision. Gaining a piece through a series of tactical moves by move 32, Rakesh played confidently to wrest the full point by 51st turn. 63 titled players including 15 Grandmasters saw 179 players from 12 countries participating in this event, that took off along with FIDE Rated Open Category “B” tournament. The parallel Category “B” event has 372 players including two title holders. The ten round tournament offers Grandmaster and International Master Norm chances for aspiring players. 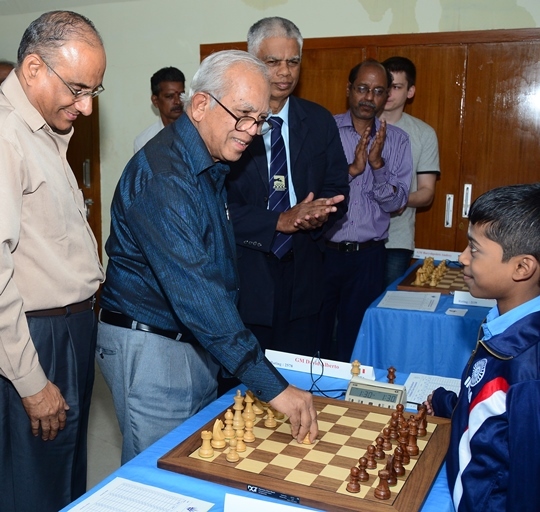 Earlier, the tournament was inaugurated by Arjuna Awardee and India’s first International Master Manuel Aaronwho made the symbolic first move against former World Under 8 Champion R Praggnanandhaa. Present in the dais were Shri D V Sundar, Vice President, FIDE, Shri V Hariharan, General Secretary, Tamil Nadu State Chess Association, Shri R Rajesh, General Secretary, Kerala State Chess Association, International Arbiter R Anantharam. Vivek Nambiar lost to Ivan Popov (Rus), Alberto David (Ita) bt S Yogit, Mukherjee Debarshi drew with Sabino Brunello (Ita), Andrey Baryshpolets (Ukr) bt Pratik Patil, Jayavel Mugil lost to Mikhail Mozharov (Rus), P Iniyan lost to Alexander A Evdokimov (Rus), Aref Vasli (Ira) lost to Eldar Gasanov (Ukr), Duc Hoa Nguyen (Vie) bt A Ra Harikrishnan, Rakesh Kumar Jena bt Axel Rombaldoni (Ita), Sarin Nihal drew with Jonathan Cruz (Peru). Paul Arokia Raj S drew with Yashwanth Raj S, Ayushh Ravikumar lost to Anilkumar O T, Manigandan S S bt Senthilkumar K, Adarsh Tripathi lost to Dusthageer Ibrahim M, Uttam Sharma bt Rohith Krishna S, Rajesh Vasanthakumar lost to Sahu Rajendra Kumar, Vijaya Sharathy bt Vijayaraj P, Aravinth Shanmugam S lost to Gopalakrishnan K, Nanda Kumar T S bt Rindhiya V.